Boy, do I have a fun one for you all today! My friends, meet The Conrad Family! These three are from Durham, North Carolina and were some of the sweetest/cutest people I’ve ever met! I’m excited for you to see this film photography session and feel the vibe from this adorable family. This was a in-home session and these sweet as can be parents have a beautiful little girl named, Anna. Anna just turned one years old and so they decided that they wanted to do one year photos to capture this time in her life! I love this idea and I know all parents are with me when you see just how much our little ones develop and change from year to year. To get to capture the movements, personality and interests through photography is something that you will cherish for the rest of your life. I loved the neutral color pallet that the family picked for their outfits and I especially liked how moms lipstick popped because of it! Their home was so lovely to walk through and we had a blast going from room to room with little Anna leading the way. 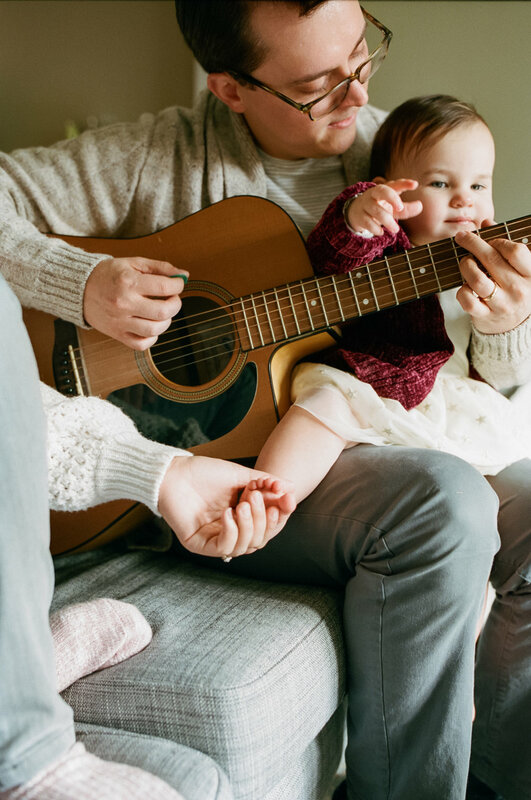 We danced together, dad played the guitar for us, and there were lots of giggles, snuggles and just pure happiness all around. It didn’t take long for me to see that they all loved each other so so much.